Fans of Dario Argento’s 1977 classic, Suspiria, weren’t exactly pining for a remake, but in 2018 they got one anyway. Argento’s fellow Italian director, Luca Guadagnino, has thrown down the gauntlet with his reworking of the beloved horror shocker, and now the opinions are ours to form. Even though a 21st century Suspiria might have been the last thing that movie-lovers were expecting, they bestowed enough attention on its reincarnation to give it a solid run at the box office. But Suspiria 2.0 always had a tough road ahead of it, as Guadagnino must have known. Any time a beloved film is remade, its admirers will always be skeptical. They demand to be won over – for the usurpers to prove that they’ve understood the appeal of the original well enough to provide something better, or at least something respectfully different. So how does 2018’s effort measure up? Guadagnino’s Suspiria indeed succeeds as a remake, and stands independently as a solid film. Though it’s not without a few weak spots, potential viewers should approach with confidence. A remake must walk a razor’s edge: though likely to suffer in comparison to the original, it can’t make too many deviations either. The task is immediately daunting. No matter how excellent the new film is, it can never escape its roots; therefore it risks never developing an identity separate from the prototype without which it could never succeed. These facts are considered and understood in the ambitious 2018 Suspiria, which manages to position itself as both respectful and rebellious… at once vintage and visionary. With a warning about potential spoilers to follow, here are 10 Reasons Why The 2018 Suspiria Remake Is A Great Film. Even though Suzy Bannion was already a strong character, we previously formed our opinions of her in real time, based solely on her reactions to the events unfolding on screen. Little was known of her background and how it shaped her into the young woman who showed up on the steps of the Tanz Dance Academy. Not so in the 2018 film. Through a series of flashbacks and dream sequences, a portal is opened into Suzy’s childhood, and glimpses of an extreme religious upbringing are shown. Framing Suzy’s passion for dancing and her enrollment in the dance academy as a means of escaping a miserable, dead-end home life is an authentic and welcome touch. This backstory isn’t a forced, tacked-on effort, but rather adds depth and substance to an already strong personality. Suzy’s mother turns out to be an especially noteworthy presence whose influence left a powerful imprint on the psyche of the young girl who grew into the strong, intrepid dancer. One of the most delightful revelations of 2018’s Suspiria is also one of its defining strengths. 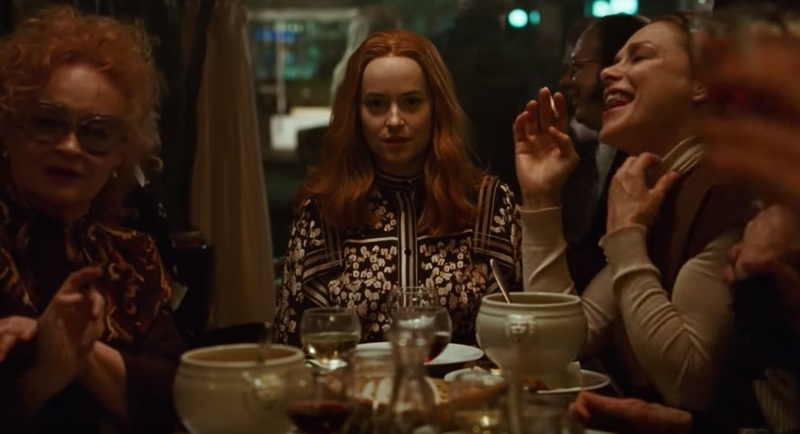 Dakota Johnson’s turn as Suzy Bannion is a huge asset to the film, and it’s the key performance on which the success of Suspiria rides. Escaping the limitations of her role in the “Fifty Shades” series, Johnson here has her hands free to turn in a high caliber performance, which also delivers her from being potentially pigeonholed or typecast for the rest of her career. The lurid, Technicolor reds that bathed scene after scene of the original Suspiria seem to have been transferred to Dakota Johnson’s fiery red hair for the remake. As Suzy, she projects a strong vulnerability which is shaped more by Suzy’s lack of experience than by any deficiency in her ability to meet the challenges she will face at Tanz. The personality type she crafted for this role is the archetypal character whom bullies love to pick on, only to find out later that they were toying with wrong person. Johnson emits the innocence and suppressed energy that Suzy requires for her role in the new film, and delivers an explosive performance even better than we dared hope for. As impressive as Dakota Johnson’s performance was, it would ring less true were it not echoed by an equally adept performance in the role of Madame Blanc. 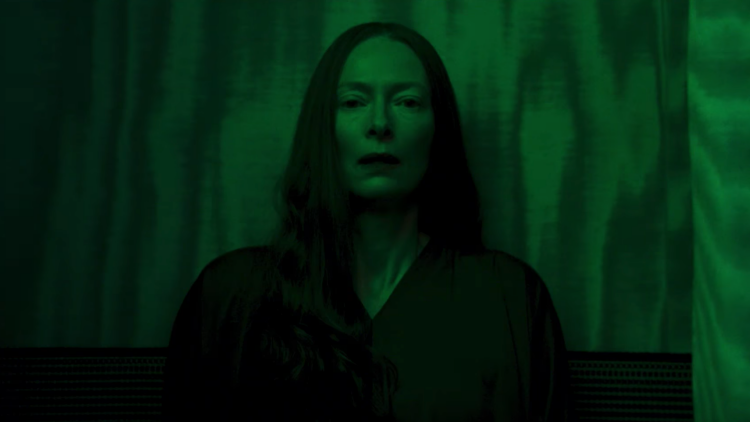 Tilda Swinton brings a physically and emotionally commanding presence to the portrayal of the dance instructor who is Suspiria’s most visible antagonist. But in this remake, the portrayal of Madame Blanc is delivered with a bit more nuance and subtlety. 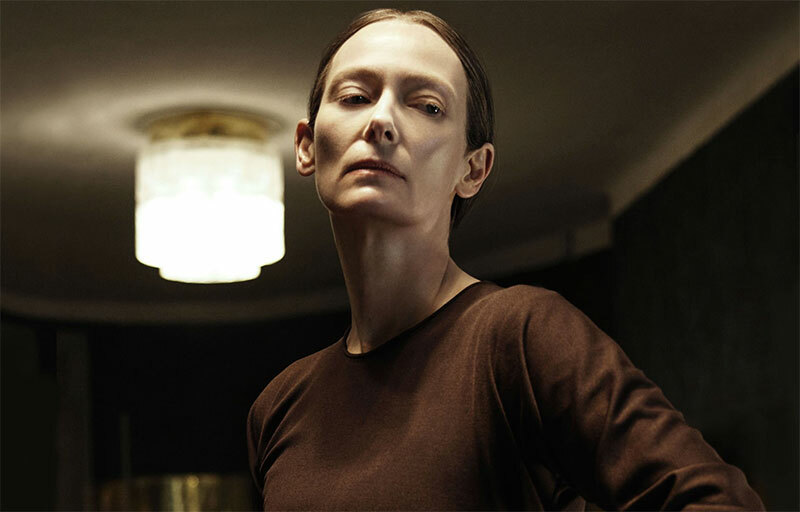 Tilda Swinton’s perceptive, piercing eyes contain and conceal varying degrees of internal warfare in Guadagnino’s film. She is sensitive, yet powerful; calculating, yet conflicted. To Suzy, Madame Blanc seems more of a mother figure in this version. The parallels between her position as matron of the dance academy and her implied role as a parental replacement for her new pupil seem clear. There’s a great overhead shot of Suzy and Madame Blanc that perceptive viewers will want to watch for, which frames these two powerful women as mirror images of each other. In this remake, it’s a winning combination that presents enhanced reflections of the original characters. In the 1977 Suspiria, dancing was present in the mood of the film and the aura of the setting, but it rarely took center stage. Instead, the dancers seemed to stay in the background, serving mainly to facilitate scene transitions or create visual distractions for the viewer. In the 2018 remake, dancing has been elevated to a prominent status, and the effect is a welcome one. The innovative choreography features frequently, and always at crucial moments. Dance lessons are the scenes of personal growth for Suzy, of psychological dominance for Madame Blanc, and of power struggles between the students. Much more disturbing are the scenes where dancing seems to be used as a weapon, where the choreography takes the role of a twisted voodoo doll and the dancer is the enchantress. Part of the difficulty with imagining a remake of Suspiria involved the feeling and the time period evoked by the original. The 1977 film felt delightfully of its own era, and yet it’s always maintained an irrevocably timeless quality as well. Part of that effect was created through Argento’s use of color, which was drastic and bold enough to ward off any complete sense of reality from the proceedings. The stunning Technicolor reds and blues which pervaded the original provided both style and substance. The new Suspiria’s use of color is one example of what makes the film work as a whole. The remake respects the original, but is not trying to imitate it; therefore, it succeeds in creating a new identity which helps to set itself apart. Gone are the flashy, nightmarish colors, and in their place is a muted color palette which more naturally replicates the world as we know it. As a result, Suspiria’s horror feels more immediate, with its characters and settings seeming even more relatable. The fresh color palette is a major reason that viewers will feel like they’re watching a film which has found its own voice when they experience 2018’s Suspiria.